12 enchanting animal stories for kids! Hear the legend of Alvarado, king of the cats. Experience the extraordinary tale of survival of an orphan foal. Discover magical sea creatures on a beach adventure. Find out the problem with pets from outer space, and solve a puzzling pig-napping. 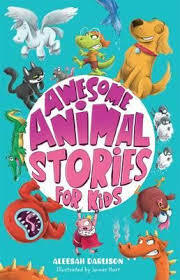 These great stories and more inside Awesome Animal Stories for Kids!.